Early tin streamer worked their tin ore on site. They would crush the tin-baring gravel in a block of granite hollowed out and used as a mortar, in much the same way as a mortar and pestle are used in the kitchens. Occassionally you can still find discarded mortarstones in old tin-streaming areas. The best places to find them are nearly always near to an old tinners hut within a tin-streaming valley. This example was found at Plym Steps tucked into the hillside by an old tinners hut. This entry was posted in Mining on 24th September 2017 by kiwinutz. As Dartmoors plutons pulsed and pushed up and through the country rocks of Devon 270 million years ago, some of these metamorphosed sedimentary layers above ,shattered and sank their altered and fractured boulders into the crystal mush of the rising and cooling magma. As they sink they are generally chemically altered, abraded and rounded off by the intense heat and continued pressure of this new super-hot environment. 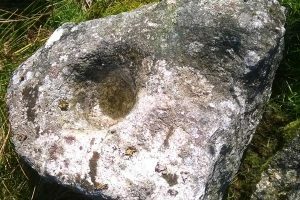 These resultant buried rocks and boulders are permenantly embedded into the granite framework until exposed later within the walls of a Dartmoor granite tor. These bizarre and erratic stones are more commonly known as Xenoliths. By definition a Xenoliths, meaning ‘foreign stones’. This entry was posted in Definitions, Geology on 19th September 2017 by kiwinutz. 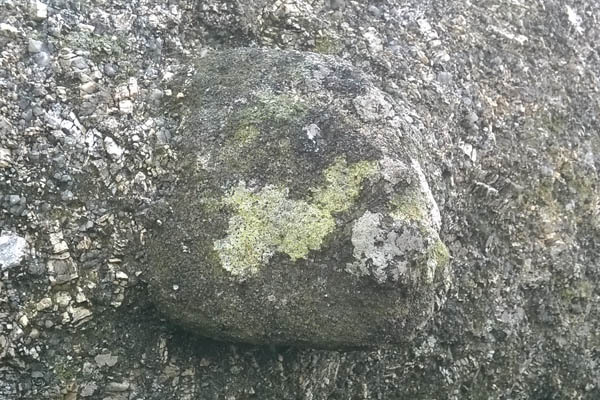 Dartmoor is one very large pluton of granite however it’s development 270 million years ago has led to some variety to its colours, forms and crystal makeup. 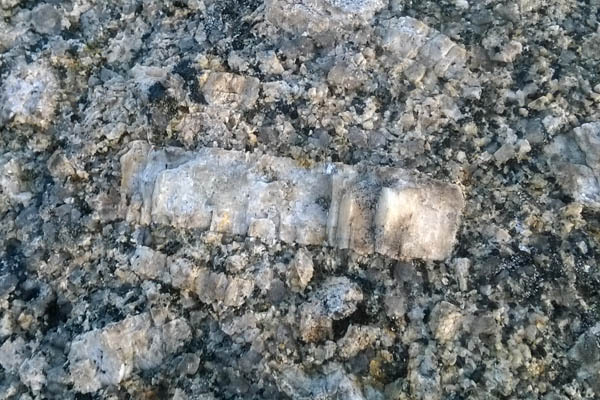 Here we have some well developed Feldspar Phenocrysts in a granite mass. 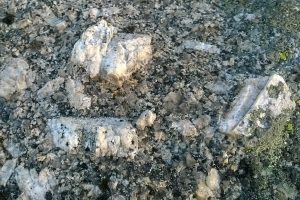 This strangley clean surface was found at Calveslake Tor. Each of the white Phenocrysts are approximately 10cm across. 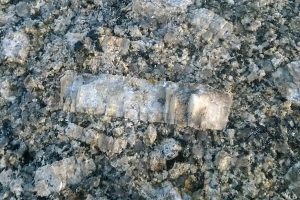 By definition a Phenocryst is; an early forming, relatively large and usually conspicuous crystal distinctly larger than the grains of the rock groundmass of an igneous rock. 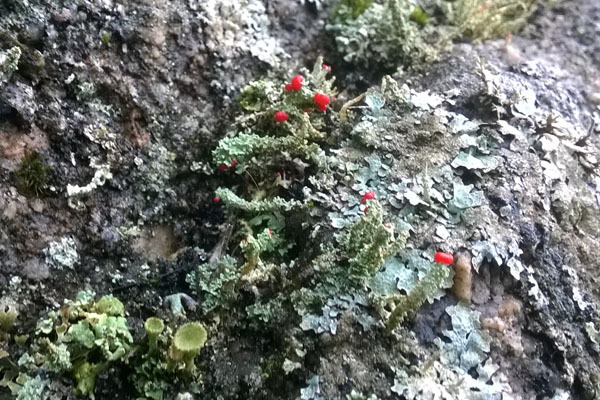 My favourite lichen find on Dartmoor is always the: Devil’s Matchstick – Cladonia floerkeana – or – Florke’s Cup Lichen. 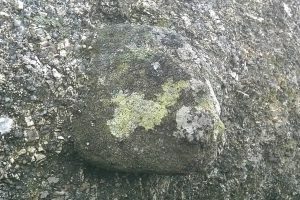 This example was found on a rough weathered boulder on the north side of Lower Hartor Tor. They appear to like to find a small niche or crevice that provide them both protection and a source of mositure. A lichen is a compound organism comprising a fungus, an alga and sometimes a cyanobacterium, co-existing in a mutually beneficial partnership. The algae and/or cyanobacteria are protected from the environment by the fungal body, and the fungus receives nutrients from the algae which are produced by photosynthesis. The cyanobacteria also have the ability to fix nitrogen. This complex relationship enables lichens to colonise a very wide range of habitats. This entry was posted in Flora on 17th September 2017 by kiwinutz. a rocky pinnacle; a peak of a bare or rocky mountain or hill. a high rock or pile of rocks on the top of a hill. Tor is derived through Old English in the form of torr. It extends back at least to the 12th century and is perhaps of Celtic origin. Other local languages with similar sounds and meanings are; Welsh tor ‘belly’ and Scottish Gaelic tòrr ‘bulging hill’. This entry was posted in Tors on 24th July 2017 by kiwinutz.